Hair art has been a thing for quite a while now, really hitting its peak in 2015/2016. Trends like space hair, fire hair, mermaid hair, and my personal favorite, rose gold hair all use creative coloring techniques to create a vibrant or subtle ‘do. Now, the creative color fad is moving on down from hair to lips, with makeup artists creating some ~seriously~ exquisite and unique looks. 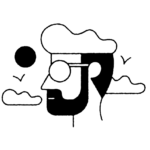 The latest in lip color trends is being called “oil-slick lips.” This trend has actually been lurking around in the beauty world for a bit (Seventeen reported on it in February), picking up a ton of traction on Instagram earlier in the year. Oil-slick lips followed the rise of popularity in oil-slick hair (aka, “rainbow hair for brunettes“) and oil-slick nails, all mimicking the multicolor iridescent sheen of an oil spill. And it’s seriously so pretty on lips, you guys. According to PopSugar, this look can be achieved *super* easily by layering on different metallic eyeshadows. That’s right; you don’t even need special lip products to get this look! I don’t know about you, but I love being able to repurpose existing makeup for fun new uses. 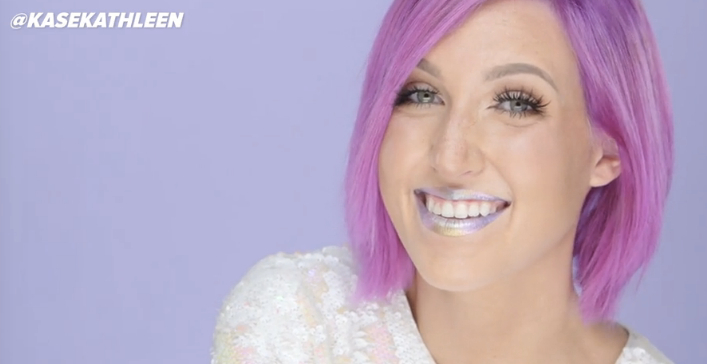 Makeup artist Kasey Ault makes it look beyond simple to rock a “holographic oil spill” lip, in her video for PopSugar Beauty. It takes her mere seconds! That’s talent. First, you start with a metallic purple eye shadow, layering it on at the outer edges of the lips. Then, you move towards the center of the lips, dabbing on metallic pinks and blues. Next, you use a gold cream shadow on the bottom and top center of the lips, to highlight. Add some more glittery pink and blue as you see fit. Finally, you clean it all up with some concealer and voila! 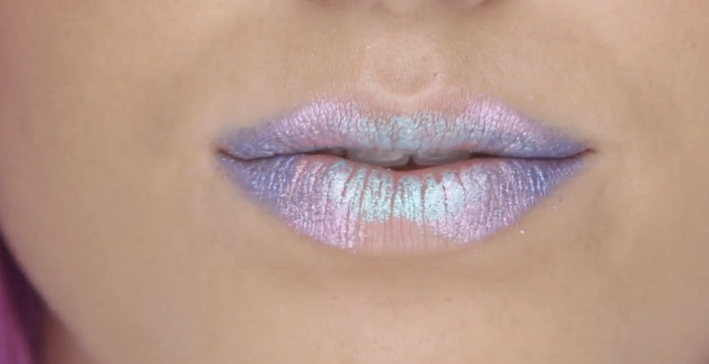 Super chic iridescent lips. The great thing about the oil slick lips look is that it’s so multifaceted. You can really do whatever you want with it — some go for a darker, inkier look, using a clear gloss on top to accentuate the sheen, while others (like Kasey in her vid) go for a brighter, more summer-y glitter-based look. Either way you rock it, this lip art is a gorgeous trend and a perfect summer night out look.